Are you interested in cryptocurrency trading? But don’t have time for full-time trading? Are you not as good at chart’s analysis? If your answer to any of the above question is YES, I think you will be interested in this write-up. And more than ever, I am excited to write this because my answer to the above questions is a resounding YES and I still want to trade. In this quest for trading, I encountered an awesome project which simplifies many things for people like you and me. And I also think that if this project succeeds, it will be the future of cryptocurrency trading. But before talking about the project straight away, I would like you to familiarize yourself with some facts and jargons. Around 90% of trading volume on Wall Street comes via HFT (aka High-Frequency Trading) and Advanced Algorithmic Trading. If you are alien to these terms, I would recommend you to visit the hyperlink above. But for now, it is just enough to know that High-frequency trading means quantitative trading that is characterized by short portfolio holding periods. 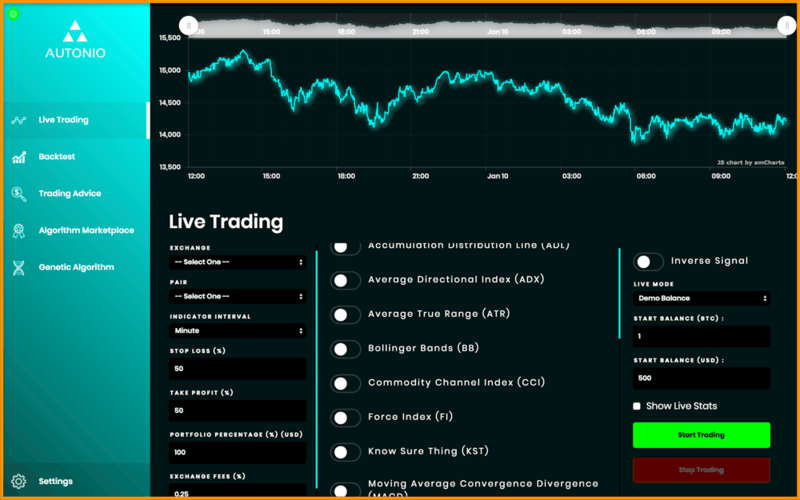 All portfolio-allocation decisions are made by computerized quantitative models in this type of trading instead of humans doing the chart and other parameters analysis. Isn’t it incredible! Well, to me it is! And one company that believes that blockchained AI-based HFT can be very successful in the ongoing market of cryptocurrency has launched its decentralized AI trading bot known as Autonio. Lets see what this company and project has to offer! AUTONIO is the first decentralized AI-powered trading bot developed, keeping in mind the high-frequency trading style and knowledge gained from the Wall Street. Just like Wall Street uses automated HFT industry, Autonio makes use of market indicators to analyze cryptocurrency trends in order to generate buy/sell signals and execute trades accordingly and automatically. Still don’t get it? Watch this short video that vividly describes what it is. Some of you might say we already have AI-based algorithmic trading and that we don’t require Autonio. But Autonio is fundamentally different from many types of systems that we know today in the cryptocurrency space. Within the cryptosphere, AI trading systems are in their infancy state and require expensive memberships or elaborate coding skills to be able to use them. Whereas, Autonio is neither costly nor does it require coding skills to start using its platform. As earlier stated, Autonio is an AI-based algorithmic trading bot which uses pre-programmed softwares that analyzes market actions, such as time, price, orders and volume. 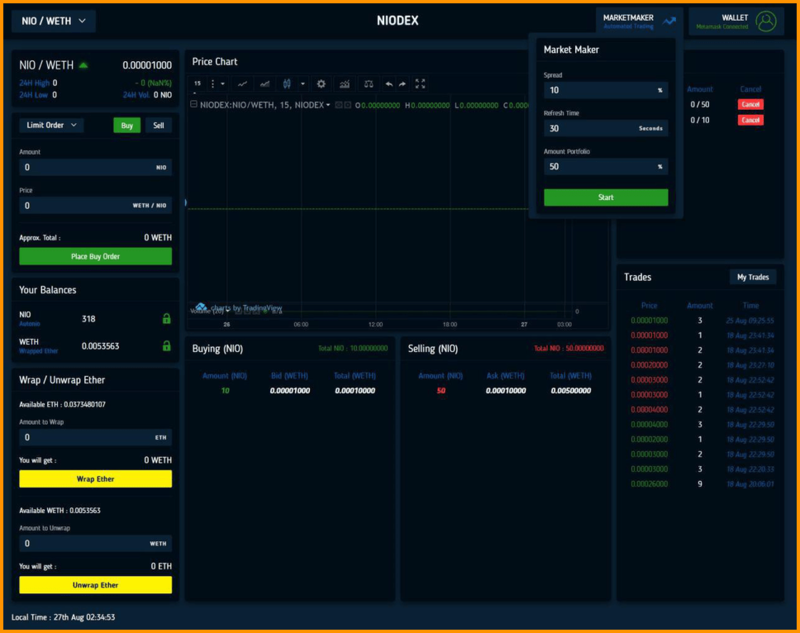 It provides a user-friendly GUI allowing its users to conveniently formulate the best strategy for trading and executing their trades. The interesting thing is, you can use more than 25 trading indicators to rigorously analyze the market in order to generate appropriate buy/sell signals to maximize your returns using Autonio. Some of these indicators are Exponential Moving Average (EMA) crossovers, Relative Strength Index (RSI), Bollinger Bands, and Ultimate Oscillator etc. NIO tokens, which are ERC-20 tokens, are used as GAS on this platform. To get membership of this platform, you need to pay nominal $50 per month in NIO tokens which are ultimately burnt rewarding the NIO token HODLers. Also, experienced traders can sell their AI-optimizations in NIO tokens to buyers who are interested in using the algorithms, thus creating a competitive marketplace of AI algorithms. This way, users who are not as experienced can copy other experienced traders and reap benefits out of it. 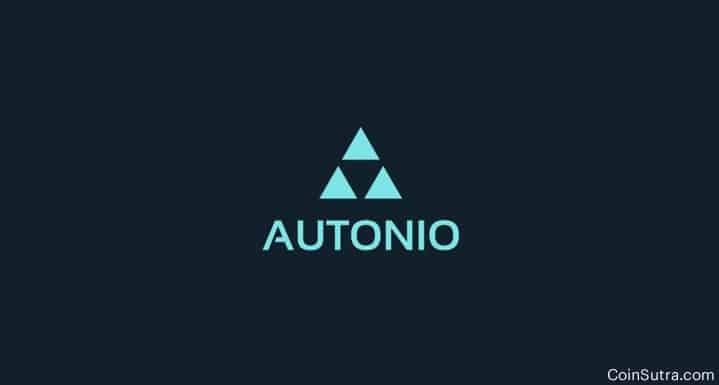 The Autonio ICO started in September 2017 with a total supply of 256 million NIO tokens with a hard cap of $10 million. The ICO, however, could not get the traction it deserved and concluded with collecting 180 ETH or about $54,000 at that time. As a result of that, approximately 35 million NIO tokens were burnt post token sale, and 35 million NIO were evenly distributed among token sale buyers according to the contribution they made with huge bonuses. Later, 154,638,654 NIO tokens were locked in a multisig wallet at 0xf2cCc772596db904F4f77290BB21Ada3B00a8A08 as team tokens which can be audited by anyone even now, leaving 65,828,135 NIO as the circulating supply on CoinMarketCap. Moreover, another interesting thing is that 80% of the total NIO supply will eventually be burnt and this will be in forms such as membership and other fees that are the part of Autonio system, which I think is a very healthy economic incentive for NIO HODLers. To put things in perspective, the initial few ICO investors are now sitting at +50,000% profit since the conclusion of Autonio ICO because Autonio skyrocketed recently and is expected to grow in the future as well. From the frozen 154 million NIO, 121 million NIO will be burnt and generate 90 million stakeable Autonio Exchange Token (NIOEX). Users with 30,000 or more NIOEX will be given VIP Status with executive privileges and access. NIOEX VIP users will enjoy 0 exchange fee, premium Algorithms, airdrops, voting rights, access to the trading pool, secure borrowing and lending options. Total supply of 220 million NIO will be burnt to 99 million NIO. NIOEX is only an exchange utility and access token and does not impact the utility of NIO. 9 million NIOEX will be airdropped to NIO holders equivalent to 10% of NIO holdings balance during a snapshot. Exchange development is in the final stages and ahead of schedule. NIOEX tokens will be sold in slot b token sale details of which will be announced at a later stage. When you first glance at the team you may not be impressed. However, after a lot of digging around for information, I can vouch for them. 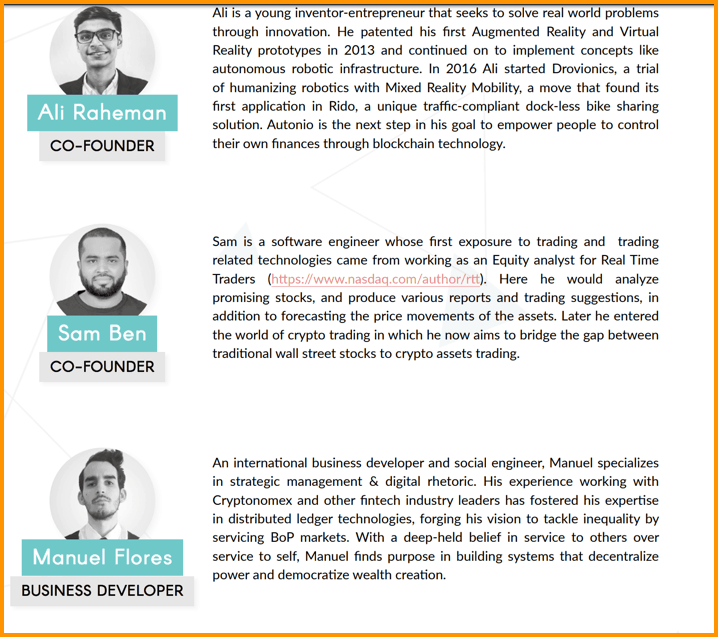 And the way they have carried forward their vision despite a modest ICO is simply commendable and speaks volumes of their dedication. However, it is difficult to say how far they can go. NIO tokens are not available on major exchanges, probably because instead of forcefully pushing things, the team is focussed on making their product better. Decentralized AI-based trading is new to the cryptocurrency space, the use-cases of which are only growing. In my opinion, early movers and pioneers like Autonio, who have a working product to use will win because cryptocurrency trading is here to stay even if the market crashes a few times. Therefore, it only makes sense in looking into this project with a long-term view because very few understand its actual worth. Moreover, promises and roadmaps like this will only push the project in a positive direction. @AI_Autonio $NIO is going to have one of the biggest 2018's. If you ask me, I am really bullish on this project based on fundamentals and the kind of result their trading bot showed in NIO crypto trading championship. See here for more details. That is all it from my side in the introduction of the Autonio project. I will be back soon with some real test results. But if you are super excited to use Autonio right now, go ahead and download the software and use this Autonio beginners tutorial to set you up. I hope this detailed analysis helps you in making a good decision. Share your take with us in the comment section below! 1.1 How Is Autonio Different? Very well written article Sudhir! This seems like a really bad idea to me. It seems as though this will drive more volatility in a market that is already highly volatile. I am not saying it won’t succeed; I am sure it will, just like it has on Wall Street. But now we can just pay a monthly fee, set a few parameters, and put our trading on Autopilot. Autopilot might be good for airplanes and cars that keep us from crashing, but taking the human interactive element out of trading seems the wrong way to go. Nice blog. Thanks for sharing the article. it is very helpful. Excellent Post Sudhir, crypto and Ai are like bread and butter, they compliment each other in such an amazingly synergistic manner. Hi there! Thanks for the article! Have you heard about bit200.net? I just started with the demo account. Nope not yet heard about it.